With news coming that former heavyweight king Wladimir Klitschko will be in attendance in Manchester for Anthony Joshua’s IBF title defence against Eric Molina, some people are wondering if Joshua will be at all affected by the sight of the man he is set up to meet in a huge fight next March/April. Will Joshua try too hard to impress Klitschko? Will he take his eyes, and his concentration, off the man in front of him? Joshua told Sky Sports how he aims to make the fight, his second title defence, “look easy.” Molina says there is no way AJ will have an easy night next month, and the Mexican/American also made it clear he does not want any excuses if Joshua underestimates him and winds up losing in a big upset. 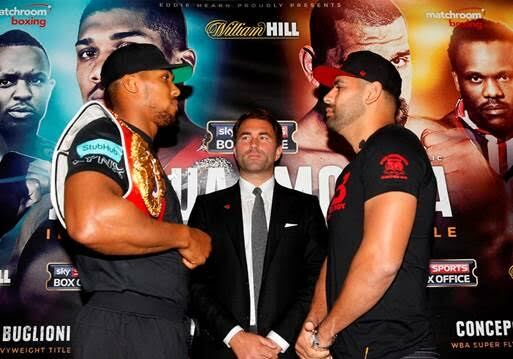 Molina told Sky Sports that he wants to face a Joshua who is fully focused and is taking his challenge seriously. Molina is not at all concerned about Klitschko being at ringside for the fight, stating how he thinks Klitschko “has had his time” and that Joshua will have a way tougher time with him than he would do against Wladimir. But Molina feels there will be no Klitschko-Joshua fight anyway, as he will score the sensation on December 10. Say what you want about Molina, but he sure can punch, he has a nothing to lose attitude and he is hungry, very hungry. And the 34-year-old makes a good point when he says no-one has an easy night against him. Deontay Wilder had to eat a big shot in his WBC title defence last summer and even Chris Arreola, who stopped a green Molina inside a round in 2012, had to soak up a big punch before getting his quick win. Molina is the underdog going into the fight next month but he is certainly a very live underdog. Previous boxing news: Lomachenko: As good as Ali? Better than Mayweather?